A Camden-based hairdresser is running an exhibition to tell the stories of LGBT clients who open up to her while sitting in the barber’s chair. 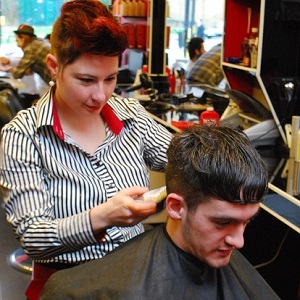 Barberette said she started offering her ‘gender neutral’ services after struggling to find hairdressers who made LGBT clients feel comfortable asking for styles that fit their identity. Once they do feel comfortable, she says people tend to reveal a lot about themselves to their hairdresser. The exhibition’s curator, Sarah Westlake, came up with the idea of creating a collection of stories and photographs, taken from every LGBT client who sat in the chair on Saturdays in January. The resulting ‘A Hair’s Breadth’ exhibition will go on display for two weeks at The Blacksmith and the Toffeemaker in Clerkenwell from Monday 29 April. “We found that so many similar themes came out,” said Westlake. “People were talking about when they wrested control of their hair from their mum, and what it was like as a child wanting a boy’s haircut and not being able to have one, and what it’s like as an adult woman wanting a boy’s haircut and not being able to find someone who’ll do it. It was important that the people in the exhibition were simply those that happened to come along, rather than being selected from any particular part of the LGBT scene. “My clients are a truly mixed crowd, and I love it,” said Barberette. “I love the gay community and I would do anything for it, but I feel like it can be very segregated. Sometimes, the trans folks hang together, lesbians over here, gay men over here, and on and on. I want to be around everyone, whatever gender, whoever they are, whoever they want to be. Segregation is putting people in boxes. “You see people who come from all those scenes, that was why it was important to capture whoever sat down,” added Westlake, who was responsible for interviewing the clients. The pair hope that the broad spectrum of people who sit in the chair will get to know each other through the exhibition. “At our Private View I’ll take a Polaroid of each person who comes in and put it on the wall with your name on it. We’ll then invite you to connect yourselves with coloured thread and write on a tag how you know each other. “At the end we’ll have a collection of pictures showing how we’re all connected, by a hair’s breadth. I want everyone that arrives in that room to leave having met everyone else.